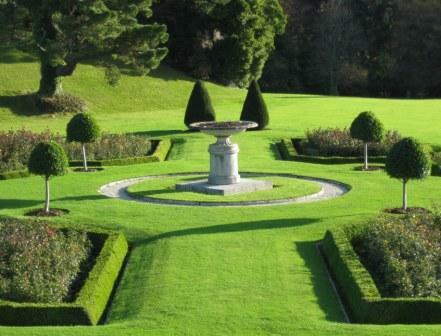 Powerscourt, in Enniskerry, is one of the best known gardens in Ireland. That famous view South, from the terraced gardens, overlooking the Triton pond towards the Sugarloaf Mountain has graced the cover of countless Irish tourism brochures. The house itself was once a very large Palladian mansion, which was designed by Richard Castle for Sir Richard Wingfield, who was given the land by King James in 1603. He was later conferred with the title of Viscount Powerscourt who along with his successors transformed an already beautiful natural landscape into a Victorian Elysian retreat, fit for a king. Who apparently never got to visit even though a throne was specially made for him, it is still there waiting for him, to this day. Never mind, today the estate on is owned and run by the Slazenger family who bought the run down 14,000 acre estate in the 1960s. Sadly the house and its contents were badly damaged by fire in 1974 although it has since being restored and is open to the public again. The ballroom is available for private venues including weddings, the lush gardens and lavish borders making for perfect wedding album pages. Powerscourt is also home to the Museum of Childhood which contains a replica of Tara's Palace which was a magnificent 22 room dolls house and garden based on the world renowned Titania’s Palace which was sadly lost to Ireland when it was sold in 1978. This new palace has been meticulously crafted and replicated in stunning miniature with new pieces being gifted and added constantly to the already extensive collection of childhood memorabilia. Tip, visit in late Autumn or Winter when it is less crowded and enjoy a hot chocolate on the outside terrace at the Avoca café for that splendid view. 1	Visit the Powerscourt Waterfall, a tourist attraction since 1721. 2 The Powerscourt Hotel (formerly the Ritz Carlton it is now part of the Marriot’s signature collection) for an overnight stay, gourmet dinner or spa treatment in the most beautiful Espa in Ireland. 4 Poppy's Café is a legend in home baking, be sure to try their smarty covered chocolate cake. 5	Kilruddery House to see the tiara shaped conservatory designed to mimic the diamond one sold by her ladyship to finance it. 6	Climb the Sugarloaf Mountain for great views and fresh air of course! 7	Johnnie Fox's the highest/oldest pub in Ireland over the road and up the mountain in Glencullen. 8	Glendalough lakes and the 6th century monastic site founded by St Kevin, great picnic stops. 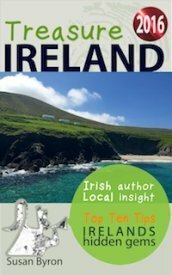 9	Drive through the Scalp (Indian Country) and down into the Glen of the Downs or garden of Ireland, at strawberry time. 10	Hike up to the Hellfire club which the devil is said have burned down after being cheated in a poker game. For more information on Powerscourt please click here.